Teddy Thompson has been called "one of the most gifted singer-songwriters of his generation" by The New York Times, and "one of the best living hopes for contemporary music” by Popmatters. He has released five albums to critical acclaim and has contributed to many other works, including duet ‘King of the Road’ with Rufus Wainwright, from the soundtrack to the Golden Globe and Bafta-winning film Brokeback Mountain. He has also collaborated on projects with Rufus and Martha Wainwright, Kate and Anna McGarrigle, Jenni Muldaur, and others. On their debut Cooking Vinyl album, Little Windows, the duo offer engaging views of the joys and sorrows of love and the vagaries of the human heart with “seamless, high-lonesome harmonies that would do the Everly Brothers proud” (Mother Jones). After their first London show sold out in eight minutes and their Celtic connections concert in Glasgow had to transfer from a small theatre to the 2,000 capacity Royal Concert Hall, Teddy and Kelly are looking forward to their first national tour together. Teddy Thompson plays at The Apex on Thursday 4 May at 7.30pm. 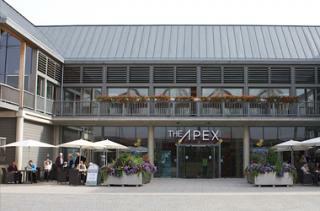 Tickets are £20, ring The Apex box office on 01284 758000 or see www.theapex.co.uk for more details or to book.